Low Carb recipes, guidelines, tips and resources. 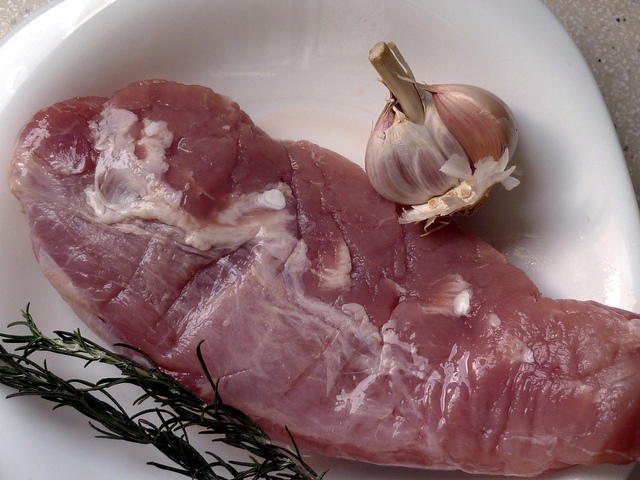 This recipe is for two pork tenderloins but is easy to multiply to make as many pork tenderloins as you need. I’ve often made up a quadruple batch and frozen three portions to cook up later. Cut several 1/2 inch deep slits into each pork tenderloin. In a small bowl mix remaining ingredients. Stuff the garlic mixture into the slits. Season each tenderloin with a large pinch of salt and pepper. Oil a foil lined baking pan, casserole dish, or cast iron baking pan. Place tenderloins in pan and roast for 30 minutes or until a meat thermometer inserted into center of meat registers 145 degrees F.
Let rest 10 minutes before serving. 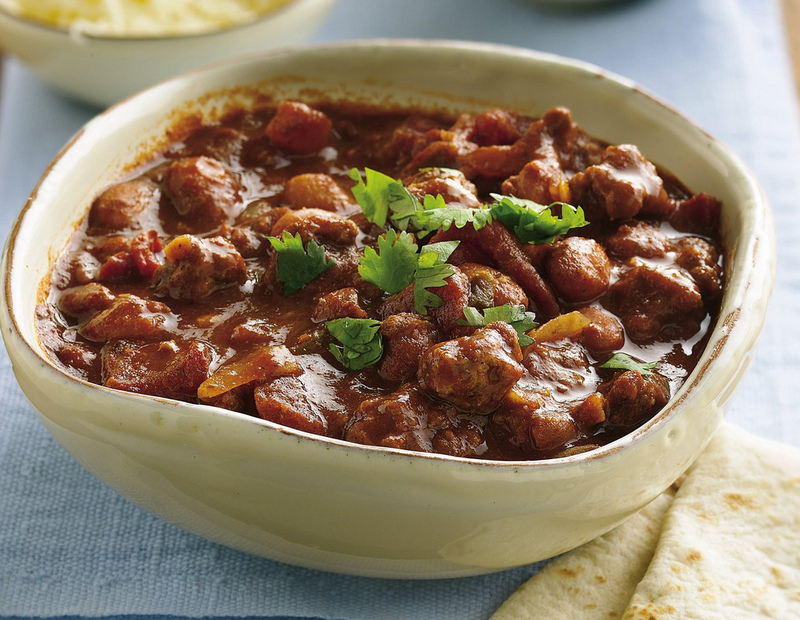 This slow cooker dish is so satisfying on a cold winter night. Put everything together after lunch and you’re kitchen will smell amazing by dinner time. Whoever thought of putting chocolate and beef together deserves to take a bow to a standing ovation and come back for an encore. Mole is generally a complicated and time consuming process; this is a pared down version that still has a rich and complex flavor. I especially love that there’s no need to brown the beef prior to adding to the slow cooker. In a five quart slow cooker stir together broth, jalapeno, tomato paste, garlic, seasoning, oregano, chile powder, and cinnamon. Add beef and onion and stir to combine. Cover and cook on high for 4 to 6 hours. Add the chocolate during the last hour of cooking. Before serving, stir and garnish with your favorite taco toppings. Note: I served this dish at a Mexican themed potluck, which is why you see white flour tortillas in the background. I didn’t invent this recipe, although I have improved it, expanded it, varied it, twisted it and generally taken it to outer space and back. I never liked the extra work of wringing out the hot cauliflower. I always burned my hands, the cloth I used had bits of cauliflower clinging to it and consequently I had a mess to clean up just from the process of wringing the water out of the cauliflower. So I add 1 tablespoon coconut flour for every head of cooked cauliflower. It sops up the water and doesn’t affect the taste or the texture. Don’t you love a simple solution? If you don’t have cooked riced cauliflower on hand, then after ricing an entire head of cauliflower place it in a microwave safe bowl and microwave for 2 minutes. Stir and microwave for 2 more minutes. Let cool enough so that it doesn’t cook the egg when you stir it in. If you don’t know how to make riced cauliflower it’s really easy. Just trim and cut a head of cauliflower into florets. Cut the florets in half so that each piece is no bigger than 1 inch square. Place half the florets in a food processor and pulse until you have a fine texture similar to bread crumbs. Dump into a microwave safe bowl and pulse the other half of the cauliflower. Save the cauliflower stump to make a salad. Just shred it on a box grater into a bowl. Use your hands to wring out the water and mix it use it in place of shredded cabbage in a salad. Some readers have asked if they can substitute almond flour for the coconut flour and the answer is no. The almond meal won’t absorb the water. I haven’t tried using soy flour, tapioca starch or arrowroot flour but I assume they would work fine. Caulitillas can be used in place of lasagna noodles, corn tortillas when making enchilidas, as taco shells, for quesadillas, with a little cinnamon and sugar as pancakes, as bread for a grilled cheese sandwich. They are almost endlessly versatile. Try adding herbs and spices for a different flavor experience. I’ll suggest a few but you really can’t go wrong adding whatever seasoning you like to these. If after making this the first time it has too much of a cauliflower taste, you can add up to 2 cups of shredded cheese to the recipe. Preheat oven to 375 degrees F. Line a baking sheet with parchment paper. Stir together warm or cold cauliflower, eggs and a pinch each of salt and pepper. Use a quarter or half cup to scoop out onto parchment paper. Use your hands to pat each portion into a thin circle. They can be anywhere from so thin you can almost see through them to ¼ inch thick. Place in oven for eight to ten minutes, until the underside is cooked enough that you can carefully peel them from the parchment paper and flip them. Return to the oven for five minutes. Remove from oven and do one of three things: cool and store in fridge or freezer with squares of parchment paper between them, or if you’ll be using them right away, lightly oil a heavy bottomed skillet set over medium high heat and cook the tortillas until the outside is browned and slightly crispy. Turn and brown the other side. No matter how you store them, be sure to brown them before eating them. You could also brown them before storing them in the fridge or freezer. This is a quick one pan meal that you can serve with a green salad or if feeding friends or family that aren’t eating low carb, Paleo or gluten free you can serve it up with pasta, brown rice, or rolls. Place each cutlet in between 2 pieces of plastic wrap and pound with a mallet or heavy pan until ¼ inch thick. Heat 1 tablespoon of the oil in a large skillet over medium-high heat. Season the pork with ¼ teaspoon each salt and black pepper. Working in 2 batches, cook the pork until browned and cooked through, 2 to 3 minutes per side; transfer to a plate. While the pork is cooking heat the remaining tablespoon of oil in a second large skillet over medium-high heat. 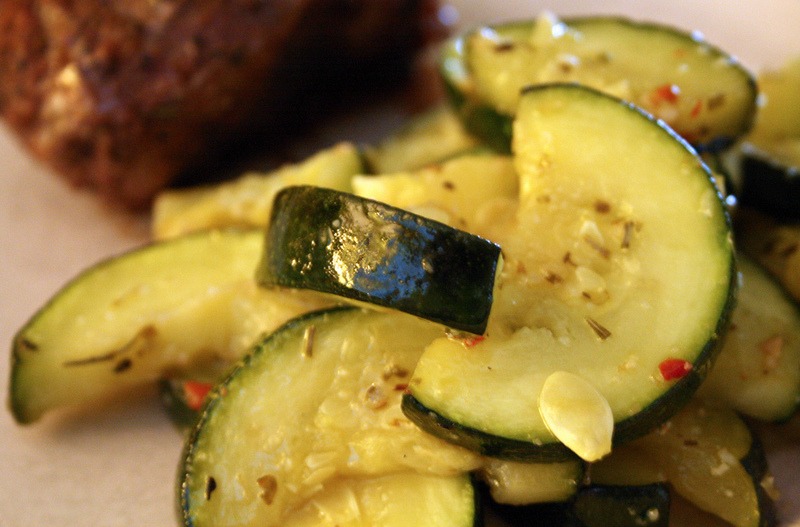 Add the bell peppers, zucchini, shallots, ½ teaspoon salt, and ¼ teaspoon black pepper. Cook, stirring occasionally, until just al dente, 5 to 7 minutes. Add the olives, parsley, and vinegar to the skillet and toss to combine. Serve the pork topped with the vegetable mixture. I can’t claim to have invented this recipe, but I’ve worked out some of the kinks and wanted to make it available to the UnDiet gang. This recipe works as a pizza crust, bread sticks to dip in marinara sauce, focaccia , bread slices for a sandwich or just to eat as is. I’m going to give you the biggest tip of all – USE PARCHMENT PAPER. The first time I made this I thought it would be so cool to use my new cast iron baking sheet and while it delivered a nice crisp exterior on my crust, it was NOT FUN to clean up, and I lost most of the crispy exterior on my crust as it stuck to the pan. Place the riced cauliflower in a microwave safe bowl, toss with a pinch of salt, and microwave for five to eight minutes, until al dente. Set aside to cool down a bit, or mix in all remaining ingredients except egg to cool it down enough that the egg doesn’t cook when you mix it in at the end. Line a pizza pan or baking sheet with parchment paper. 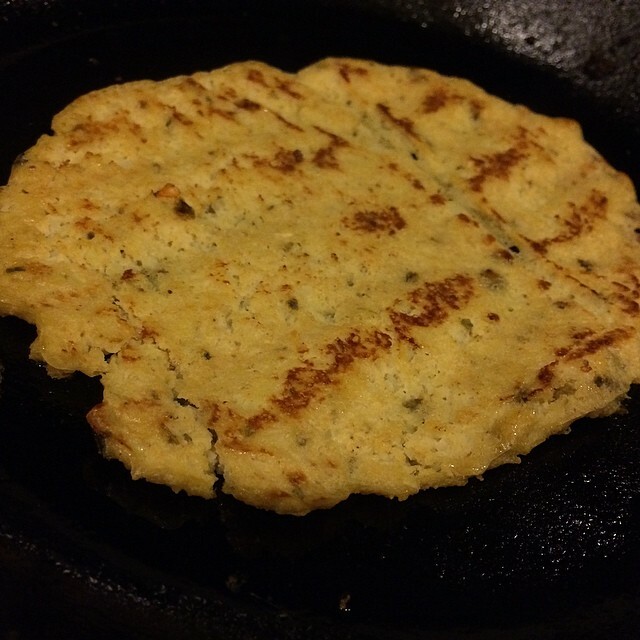 Dump the cauliflower mixture onto the parchment paper and with your hands pat it out to evenly cover the pan. If you’re making sandwich bread, use two trays so you have a thinner crust. Bake for fifteen to twenty minutes, until the top is lightly browned. Remove from oven and slide the parchment paper with the crust off the baking sheet. Place another piece of parchment paper on the pan. 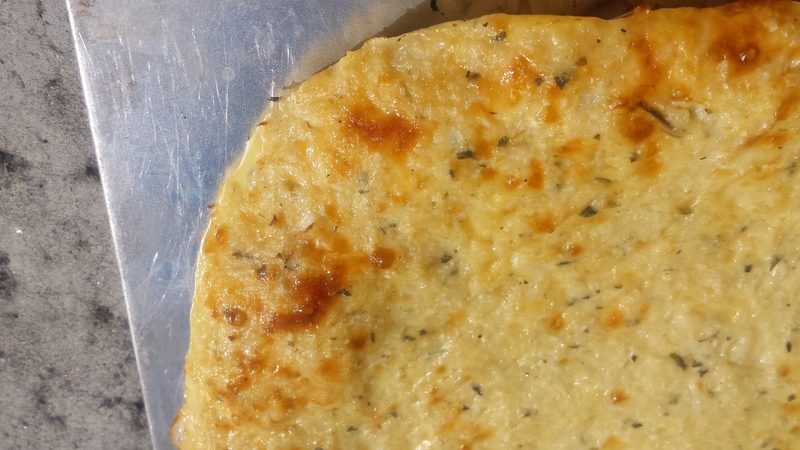 Carefully flip the crust over onto the baking sheet so that the bottom is now on top. Return to oven and bake for another ten to fifteen minutes until the top is lightly browned. Slice into squares for sandwich bread. Slice into rectangles for bread sticks. Top with cheese, sauce and toppings; place back in the oven for about fifteen minutes until the cheese is lightly browned and bubbling. Before putting in the oven scatter a handful of sliced or minced olives, sun-dried tomatoes, Parmesan cheese, feta cheese, basil shreds, anchovies … whatever your favorite focaccia toppings are. I didn’t need to remove the moisture from my cauliflower to get a crispy crust. If yours turns out soggy (which isn’t a complete failure – you can still top it with cheese and toppings and eat it with a fork), then the next time you make it, you can squeeze out the moisture from the cauliflower after cooking it or add 1 tablespoon coconut flour or use the up to 1 cup grated (not shredded) Parmesan in place of 1 cup of Mozzarella. 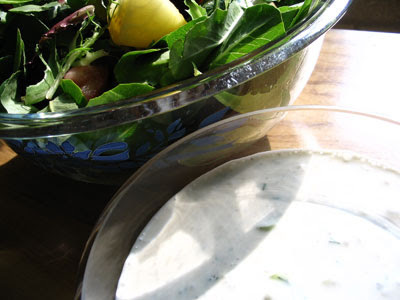 If you’re doing Paleo or completely off dairy, you may be missing creamy salad dressings. I was experimenting with coconut cream (I bought a TON of it when there was a sale at Whole Foods) and decided to try it in place of buttermilk in a salad dressing – and it worked! You can substitute toasted sesame seed oil for the olive oil for an Asian flair. This dressing is good over greens, or roasted vegetables. Place all ingredients except oil in a blender and buzz until smooth. Keeping the motor running slowly pour in the oil until it’s emulsified into the dressing. Taste and adjust seasoning if needed. Shredded cauliflower used in place of rice is the new Paleo and Low Carb Hero. I’ve been doing a bit of experimenting to find the easiest and foolproof way to prepare it and have come up with lots of options which I’ll be sharing in upcoming posts. 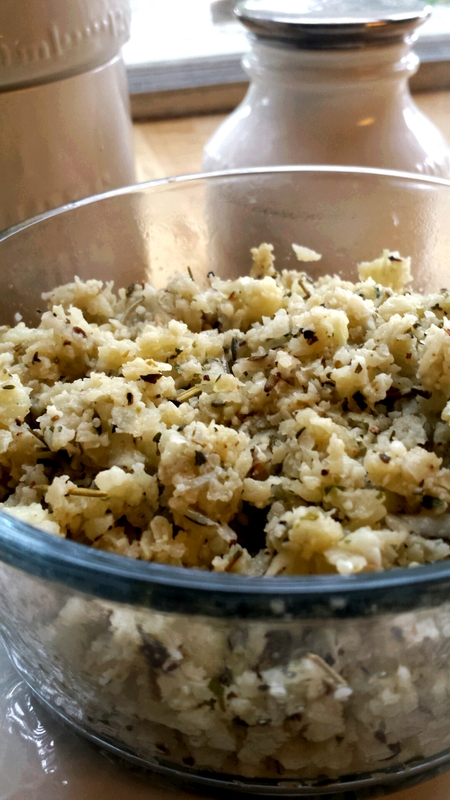 Today I want to share my Provenical Cauli”rice” recipe. Warning: this recipe does not mask the taste of cauliflower. It will taste like a French vegetable dish, not like rice. I’ve found that the cauli”rice” recipes that taste closer to rice are those that are heavily spiced such as curried “rice”, Spanish “rice”, and those with tomato paste. I’ve been shredding cauliflower for these recipes using my food processor which involves cutting the florets away from the core. Getting out the food processor and fitting it with the shredding disk. Shredding the cauliflower. Cleaning and putting the food processor away. Today I wanted to see if using a box grater would be easier – and it was – significantly easier. I trimmed away the green leaves and that was all the prep needed. I shredded the whole cauliflower with the box grater, stopping when I reached the core. It took less time than it took using the food processor (including the setup and cleanup) and I burned a few calories in the process. So in the future I’ll use the food processor if I already have it out for other projects but otherwise I’ll use a box grater. Trim the green leaves from the cauliflower and shred the florets using a box grater or food processor. Discard the stem and core. Heat oil in large saute pan over medium heat. When oil is hot add the shredded cauliflower and stir to coat with oil. Stir in Herbs de Provence, salt and pepper. Cook until cauliflower is al dente. Remove from heat. Taste and add salt and/or pepper if needed. Drizzle the finished dish with extra-virgin olive oil or melted butter. If you’re doing Paelo you’ll want to avoid the butter though. Use Italian seasoning in place of Herbs de Provence. Thank you to Erica Rivers Cooks for this fab pic of her version of this meal. This breakfast is a great way to use leftovers from dinner. Use any cheese, meat and veggies that you have available. Don’t be shy, this works great with chicken, steak, crab, lobster, sausage … and pretty much any veggie you have cooked up with the exception of maybe fennel, beets, cabbage, or okra. The proper way to make this meal is to heat the meat and veggies in a separate pan from the eggs, but I usually just use a large pan and cook the eggs on one side and heat the meat and veggies on the other side. I don’t worry if some of the egg gets onto the meat and veggies side, I just move it back to the egg side and keep cooking. Heat butter in small skillet. Add eggs and cream, season with a pinch each of salt and pepper and stir to combine. Stir occasionally and when eggs are almost completely set sprinkle cheese on top, cover and remove from heat. Reheat meat and veggies in a separate pan. Slide onto serving platter or individual plates. Top with eggs. The Scots are famous for deep frying pretty much anything. Deep fried Mars bar anyone? They have them in Scotland. This recipe is a healthier version than the traditional deep fried Scottish recipe. To make breakfast easier you can hard boil the eggs the night before or use leftover Easter eggs. You can even make them completely, refrigerate them and serve cold, room temp or reheated the next day. Bring a small pan with 4 cups of water to a full boil. Carefully place 4 of the eggs in the boiling water. Place a lid on the pot. Turn the heat off but leave them on the burner. Set a timer for 20 minutes and then remove from burner and pour off the hot water. Run cold water into the pan and when the eggs have cooled enough to touch them, peel them. Place the flour on a plate. Place the fifth egg in a pie plate and lightly beat. Place the pork rinds in another pie plate. Roll the eggs in the flour to coat. Wrap each egg with a portion of the sausage. Dip sausage wrapped egg in the beaten egg and then coat thoroughly with the pork rind crumbs patting lightly so they adhere well. Place coated eggs in a lightly oiled baking dish and chill for one hour. Preheat oven to 375 degrees. Bake eggs until golden brown, about 30 minutes. Skip the pork rinds, flour and fifth egg. Just wrap the sausage around the hard-boiled egg and go from there. If you don’t have parchment paper Do NOT use waxed paper; the wax will melt, get into your food and possibly ignite in the oven. No kidding! Aluminum foil isn’t a good substitute either because the lemon juice will cause a reaction with the aluminum that is not tasty. Trust me, it’s NOT TASTY. If you don’t have parchment paper you can bake the fish in a covered dish. Grease two 12-inch square pieces of aluminum foil using extra-virgin olive oil, butter or coconut oil or go easy on yourself and just spray them with cooking spray. Place 1 piece of fish and one slice of fennel in the center of each piece of foil. Sprinkle with lemon juice and seasonings. Fold the aluminum foil to create a well-sealed packet. Place the packets on a baking sheet and bake for 12 minutes. Carefully open the packets so you don’t burn yourself with the steam. 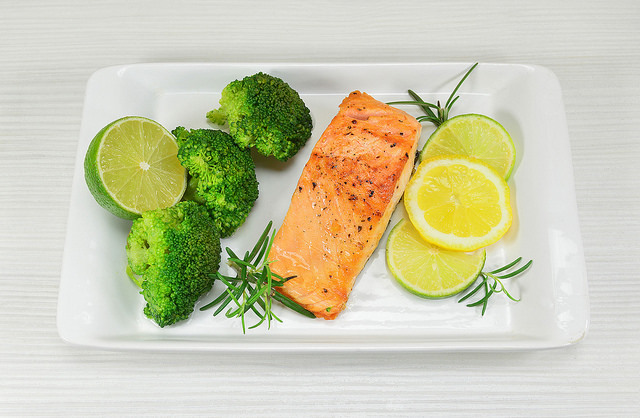 Use a spatula to slide the fish onto dinner plates, or go native and eat right out of the packet. If you use a plate be sure to pour the drippings over the fish. Use tomato slices in place of the fennel or onion. Use dry white wine in place of the lemon.